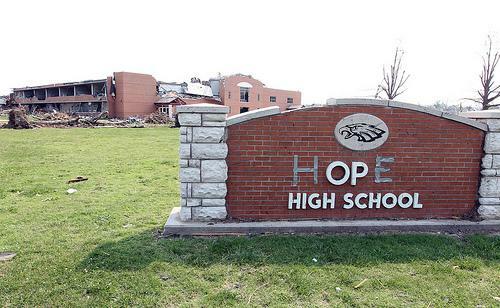 Joplin High School following the May 22 tornado. U.S. Education Secretary Arne Duncan and Homeland Security Secretary Janet Napolitano will be in Joplin Thursday to visit the city's "mall school." That's the shopping mall school where 11th- and 12th-grade students began attending classes last month after Joplin's high school was destroyed in a tornado. The May 22 tornado either destroyed or damaged 10 schools in the area, at an estimated cost of $151 million. Former Missouri U.S. Senator Kit Bond could soon have his name emblazoned on a new federal courthouse in Jefferson City. The U.S. House voted 407-2 yesterday to pass legislation designating the recently built facility as the Christopher S. Bond United States Courthouse. The measure now awaits President Barack Obama's signature to become law after the U.S. Senate approved it in July. Two listeria cases from Colo. cantaloupes confirmed in Mo. The Centers for Disease Control and Prevention says it has confirmed two Missouri cases of people contracting listeria from Colorado-grown cantaloupes. The state Department of Health and Senior Services was notified Wednesday of the cases, both in southwestern Missouri. The state agency says one of the two was a 94-year-old who has died. But the agency also says the cause of death has not been determined. Missouri referred five listeria cases for testing by the CDC. Two were identified as a different strain than the one associated with the cantaloupe. The remaining case was being tested. The national outbreak has been traced to a Colorado farm that recalled the tainted cantaloupes last week. Most healthy adults can consume listeria with no ill effects. Symptoms include fever, muscle aches and gastrointestinal problems.